This is a carte-de-visite showing Abijah Wells who was an early pioneer, lawyer, and financier in Nemaha County, Kansas. He was born June 12, 1840, the son of William R. and Betsy K. Skinner Wells. The family came to Kansas in 1857, and soon after their arrival, William became involved in the free-state movement. 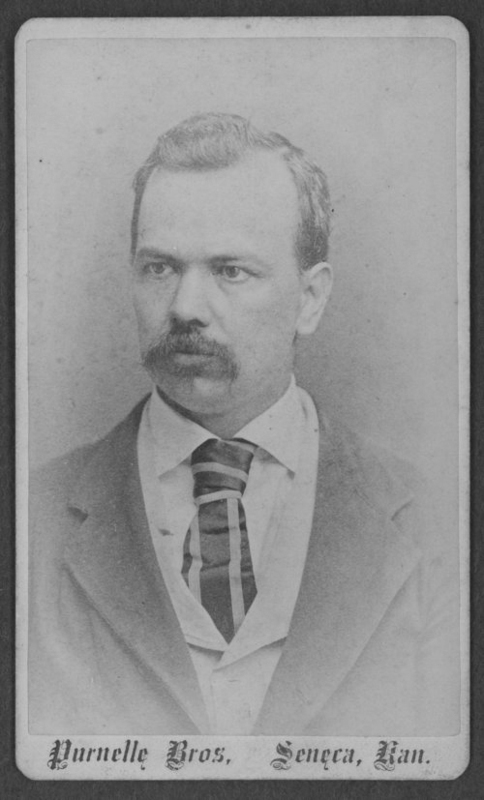 Abijah attended Centralia College and later attended Kansas State Agricultural College. Early in life, Abijah decided to enter the legal profession, and after college, he entered the law office of J. E. Taylor, where he studied law. He was admitted to the Nemaha County bar in 1866 and practiced law all his life except for four years while a member of the Kansas Court of Appeals. In that same year, he married Loretta C. Williams, the daughter of Captain Arthur William Williams and Mary Angeline Nordyke. In early 1881, he became the editor and owner of the Seneca Tribune and later that year sold the paper. Wells held many offices including clerk of the district court, register of deeds, superintendent of education, mayor of Seneca, and the Seneca school board for a number of years. In addition to his legal career, he was vice-president of the National Bank of Seneca and involved in various financial interests. Abijah Wells died March 1, 1915 in Los Angeles, California.